If it’s 12AM and your Nintendo WII power supply goes on the fritz and you can’t locate one at your local Wal-Mart and you’re jonsin’ to play a new game have no fear! I too found myself in this situation recently. Like most computer dudes I have a plethora of computer parts lying around in my parts closet. It’s really not all that uncommon to have a power supply or two lurking in the parts bin. In this document I’ll teach you how to juice up your Wii and get back to gaming with simple items almost every geek has. Amazingly the Nintendo Wii’s power brick is rated at 3.0A (Amps) and normal PC power supplies rate at least 5-7A (Amps) on the 12 volt (yellow-wire) side. There are some other articles online outlining the procedures to replace a small soldered-in fuse inside the power brick. We didn’t have a fuse or the time to try to remove the strange shaped screws holding the brick together. Disclaimer: We do not claim that the below will not harm your Nintendo Wii. We have tested it and everything appears to work but we cannot speak to the “cleanliness” of the power delivered by the power supply used nor can we assure that any other issues may be caused. Please use this document at your own risk. 1. Since you’re not going to use your old power brick anymore, cut off the end which plugs in to your Wii closest to the brick as possible. 2. Strip the grey sheathing from the wire. This will reveal a white wire surrounded by another wire. 3. 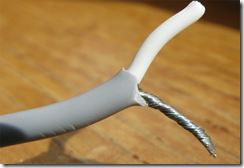 Take the wire around the outside and twist it together to form one wire. 4. Strip the white wire. Be careful to leave enough insulator between the white wire and the outside wires we previously twisted. 5. Locate your Molex to SATA converter. Cut the black and yellow wires closest to the SATA connector. 6. Strip the black and yellow wires. 8. Connect Black to the outside wire we previously twisted. 9. Use electrical tape to make the connections or optionally solder the connections together. 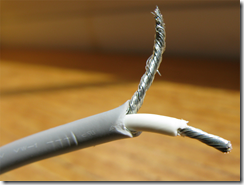 Use plenty of electrical tape or heat shrink tubing to secure the connections and insulate them. 10. Plug in your molex connector to the power supply. At this time your Nintendo Wii is connected to the power supply. 11. Unbend your silver paper clip and insert one end in to the ATX connector’s green wire. Connect the other end to the black ground wire next to the green wire. This sets the ATX power supply to be on at all times. 12. Plug in your ATX power supply to wall power. Polarity for the Nintendo adapter is printed on the bottom of the brick but does not outline which wire (the outside or inside) is positive or negative. 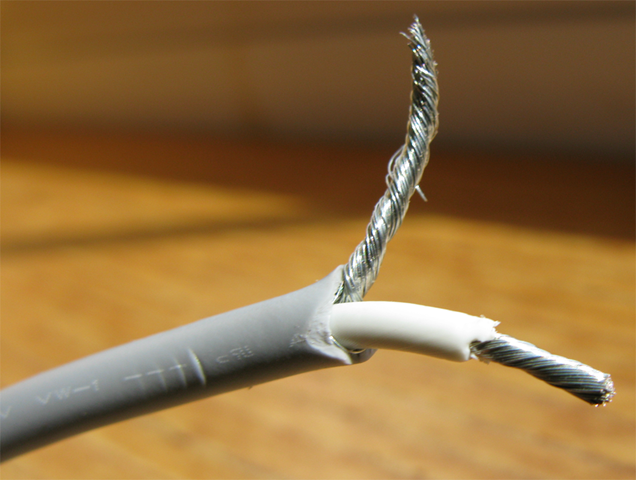 The outside wire is DC negative (-) and the inside white wire is DC positive (+). To power a Nintendo Wii with a PC power supply is very easy and certainly feasible. I’m not sure the long term affects of using this solution but it does make complete sense to use a PC power supply because that is, essentially, what a Nintendo Wii is – a computer. To this day the solution is still working and I haven’t found a need to buy another power brick yet. This solution/fix was a bit overkill but at the time it made sense to get the gaming system back online.